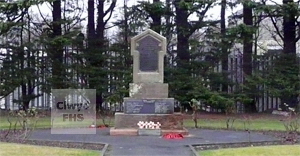 The Greenfield War Memorial commemorates those men of the area who died in the First and Second World Wars. It stands in the Memorial Gardens on the corner of Dock Road and Bagillt Road. A Roll of Honour is displayed in Holy Trinity Church. The church also contains the Courtaulds War Memorial which commemorates those men who worked at the former local Courtaulds rayon and nylon factory and died in the Second World War. Greenfield (Welsh: Maes Glas) is a suburb of Holywell, on the Dee Estuary in Flintshire. Between 1974 and 1996 it was in the county of Clwyd. (5th Bn.) 30 Nov 1915 25 Son of John Thomas & Elizabeth Ames, of 4, Green Bank, Greenfield. Pieta Military Cemetery, Malta. ("B" Coy. 5th Bn.) 26 Mar 1917 24 Son of Mary Jane Butler, of 6, Mount Pleasant, Greenfield, & the late William Thomas Butler. Jerusalem Memorial, Israel. 831931 Royal Field Artillery ("A" Bty. 241st Bde.) 11 Sep 1917 21 Son of Ithel and Rose Hannah Davies. Native of Penyffordd, Chester. Vlamertinghe New Military Cemetery, West-Vlaanderen, Belgium. 2564 1st Bn. Welsh Guards 6 Aug 1917 Son of Joseph and Mary Elizabeth Davies. Ypres (Menin Gate) Memorial, West-Vlaanderen, Belgium. (1st Bn.) 28 May 1918 33 Son of Edward & Elizabeth Edwards, 2, Dykin's Row, Greenfield. Greenfield Cemetery, Holywell. (City of London Regiment 23rd Bn.) 12 Jun 1916 20 Son of Alice Fowles, St. Winifrides Convent, Holywell. (1911 Census). Also commemorated on the Holywell War Memorial. Barlin Communal Cemetery Extension, Pas de Calais, France. Labour Corps (196th Coy. Depot) 2 Feb 1919 28 Son of John and Elizabeth Garbutt, of The Poplars, Holywell. St. David's Monastery Churchyard, Pantasaph. (16th Bn.) 19 Sep 1917 Son of Thomas & Elizabeth Ann Hughes, Harp Inn, Holywell. Erquinghem-Lys Churchyard Extension, Nord, France. Royal Army Service Corps 28 Mar 1918 22 Son of Henry Owen & Alice Hughes, Basingwerk Row, Greenfield. Arras Memorial, Pas de Calais, France. ("B" Coy. 24th Bn.) 31 Oct 1917 21 Son of Elias & Annie Jones, of Poplar House, Bryncelyn, Greenfield. Beersheba War Cemetery, Israel. (5th Bn.) 29 Sep 1915 30 Son of Ben Jones; husband of Sarah C Jones, f Wood Houses, Greenfield St. Margaret Churchyard, Bodelwyddan, Flintshire. Alternative Commemoration buried in St. Peter's Churchyard, Holywell. (17th Bn.) 10 Jul 1916 21 Of Glanydon, Greenfield. Son of Joseph & Mary Ann Jones. Caterpillar Valley Cemetery, Longueval, Somme, France. (HMHT Exchange, Liverpool) 23 Mar 1917 26 Son of William Francis & Sarah Ann Jones, of Brig y Don, Greenfield. Tower Hill Memorial, London, England. (25th Montgomeryshire and Welsh Horse Yeomanry Bn.) 30 Nov 1917 31 Son of Theofilus Jones, of Mostyn Road, Greenfield. Jerusalem Memorial, Israel. ("B" Coy. 16th Bn) 22 Apr 1918 21 Son of John and Martha Jones, of Rose Villa, Greenfield. Bouzincourt Communal Cemetery Extension, Somme, France. (5th Bn.) 26 Mar 1917 27 Son of John Rich & Sarah Ann Lancelot, Providence Terrace, Greenfield. Jerusalem Memorial, Israel. (HMS Fauvette) 9 Mar 1916 42 Son of the late Edward & Elizabeth Littler, of Parrys Mine, Greenfield. Sunk by mine. Portsmouth Naval Memorial, Hampshire, England. (10th Bn.) 14 Aug 1917 19 Born in Wem, Shropshire, England. Son of William & Mary Martin, 1, Railway Terrace, Sandycroft, Flintshire. Also Commemorated on the Holywell War Memorial. Menin Gate Memorial, Ieper, West-Vlaanderen, Belgium. (2nd Bn.) 22 Apr 1918 24 Son of Arthur Le Vickers & Jane Vickers, of Allenby Villa, Greenfield. Bouzincourt Ridge Cemetery, Albert, Somme, France. (5th Bn.) 4 May 1917 21 Son of David Williams, of 1, Tai Drill, Greenfield. Savona Memorial, Italy. (807th Coy.) 4 Feb 1919 29 Son of Mrs M Williams, of 1, Greenbank, Greenfield. Mazargues War Cemetery, Marseilles, Bouches-du-Rhone, France.